“The four islands of the [Japanese] archipelago should be sunken into the sea by the nuclear bomb of Juche … Japan is no longer needed to exist near us. Pyongyang is ”ready to use a form of ultimate means” to punish the United States. Honestly, compared to Kim Jong Un’s government, Trump’s efforts lack real flair or creativity. And generally speaking, Trump’s threats are just as believable. That said, there are good, and worrying, reasons why we shouldn’t just brush this off, as former National Security Council official Jeffrey Prescott has outlined. The risks here come more from the very real dangers of misstep, blunder, and accidental escalation than they do from a carefully calculated policy of coercion. Since walking out on the international agreement which had very successfully put a brake on Iran’s nuclear arms program, the United States has failed to offer a viable diplomatic alternative to getting greater cooperation from Tehran. Instead we’ve reverted to the kinds of threats and economic pressure that were proven failures in terms of reining in Iran’s nuclear ambitions. This led to Iranian President Hassan Rouhani warning Trump in a speech Sunday not to raise tensions further. Trump’s bedtime all-cap threat-tweet was his carefully considered reply. While the United States has unilaterally reimposed sanctions on Iran, our partners in the original agreement have not followed suit. As a consequence, the Trump administration is trying to put pressure on other countries to stop buying Iranian oil. The Iranians have responded by reminding us, and the rest of the world, that they can easily choke off the flow of Middle East oil and natural gas by closing the Strait of Hormuz through which those supplies must pass to reach international markets. 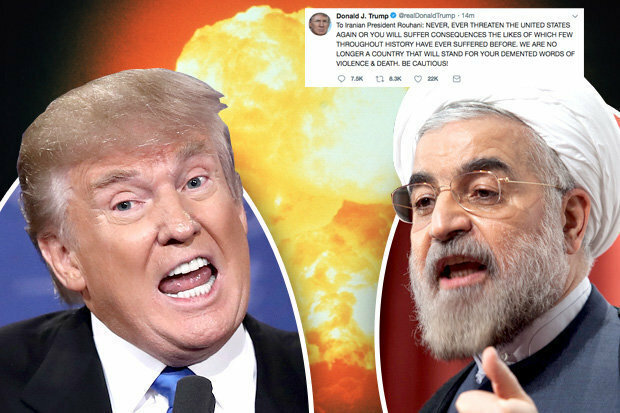 Unsurprisingly then, this increased pressure from the United States has increased tension with Iran, raising the possibilities of further escalation, deliberate or otherwise. To this mix, add the fact that Trump has surrounded himself with advisors – specifically National Security Advisor John Bolton and Secretary of State Mike Pompeo – who have long pressed for regime change in Iran. 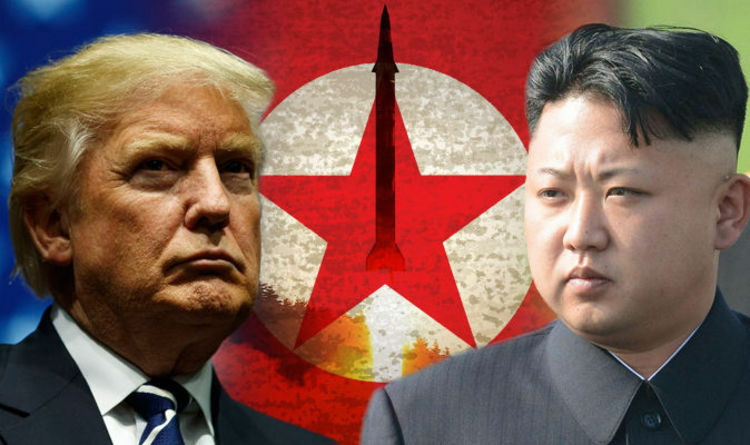 At the same time, Trump probably believes that his “maximum pressure” approach to North Korea brought that country to the Singapore summit, which, while producing great optics for Trump, delivered nothing in terms of a North Korean commitment to denuclearize. This is something the president himself has apparently come to realize even as he refuses to say so in public. So keep an eye on this one. Because war with Iran would be catastrophic, for everyone. 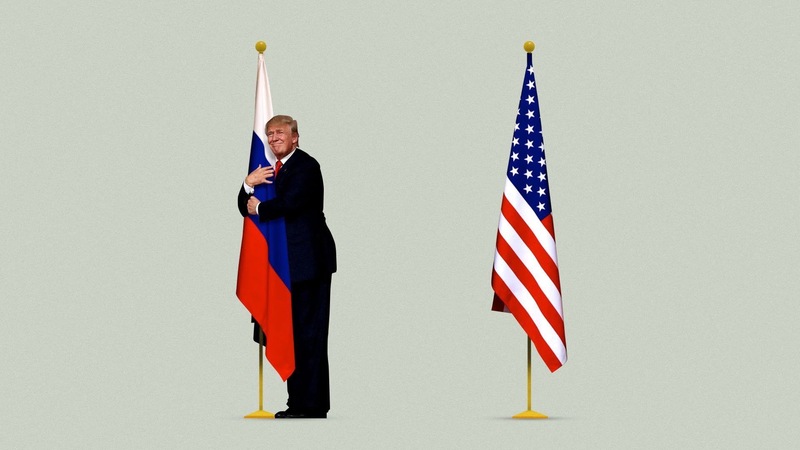 If the last few disastrous days of American diplomacy prove anything it’s this: Vladimir Putin’s investment in Donald Trump has paid off far beyond the Russian dictator’s wildest dreams. As I said on the radio this morning, it’s like Putin dropped five bucks on a scratch-off lottery ticket at the corner gas station and found the million-dollar jackpot underneath. 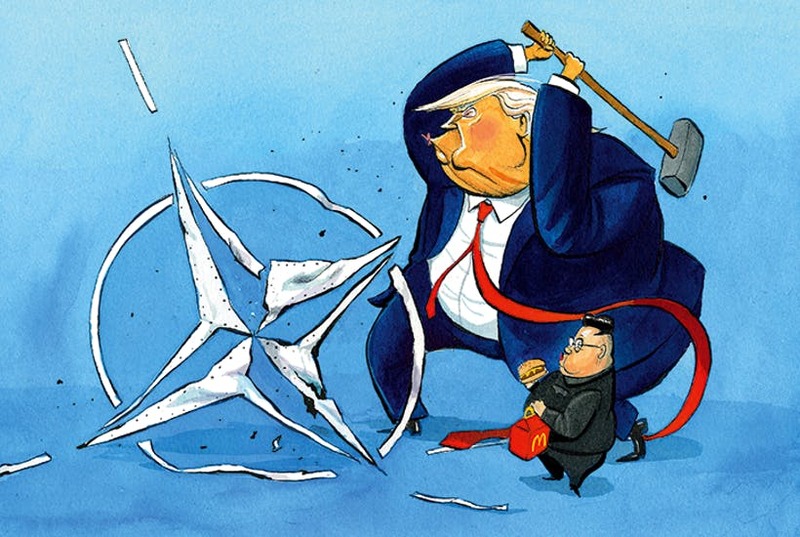 From President Trump’s attempted demolition of the NATO alliance at its summit in Brussels, to his undermining of British Prime Minister Theresa May that further destabilized her already tenuous hold over her own government, to describing the European Union as a foe of the United States, to his final lickspittle, groveling performance at the feet of Vladimir Putin before the eyes of the world’s media in Helsinki, this was a week unlike any we have ever seen in modern American foreign policy. And why shouldn’t the Russians assess it that way? In their joint press conference, Trump openly rejected the consensus of his own government and embraced Putin’s “powerful denial” that Russia had in any way interfered in the 2016 presidential election. Trump said it was the United States that was responsible for tense relations between the two countries, both his predecessor in the Oval Office and the ongoing special counsel investigation into Russian meddling. Certainly nothing he was willing to point the finger at Putin for, like waging covert war in eastern Ukraine, or using military force to redraw international borders by forcibly annexing Crimea, or shooting down a civilian air liner over Ukrainian territory in 2014, or the use of a deadly chemical weapon on British soil in an attempt to assassinate a Putin critic earlier this year. In fact, Trump didn’t mention even one of those. And why would he? When you’re someone else’s puppet, they’re the one pulling strings. Trump just acts, and speaks, accordingly. For years now I’ve had students in my international conflict class read an old article by University of Chicago political scientist John Mearsheimer, “Why We Will Soon Miss the Cold War.” In it Mearsheimer, a noted international relations realist, predicts Europe will return to the bad old days of unstable multi-polar balance of power dynamics which historically led to wars among the continental great powers. Peace in Europe during the Cold War was, in Mearsheimer’s analysis, a product of the order imposed by two roughly equally matched, nuclear-armed, superpowers. With the Cold War over, that bipolar order went with it, paving the way for a return to the old, destructive patterns of history. With the order of the Cold War gone, the states of Europe would once again be forced to put their own security first. Neither the prosperity that comes with membership in a common economic market, nor joint adherence to democratic norms and values, would be sufficient to guarantee the safety of European states in system characterized by anarchy and the requirements of self-help. Nuclear proliferation, at the very least to Germany, was assumed. War was not out of the question. But the old patterns never actually came back, despite Mearsheimer’s prediction. Thirty years on from the end of the Cold War, Europe remains peaceful, prosperous, and democratic. And neither the Germans, nor any other European state, has developed nuclear weapons. The key question I ask my students is why. Why was Mearsheimer wrong? The answer is simple: Mearsheimer assumed that with the Cold War over and the threat posed by the Soviet Union gone, the United States would abandon Europe and the NATO alliance would dissolve. That, of course, didn’t happen. President Trump is now in Brussels for the NATO summit, and has spent his time, both in tweet before and in person while there, berating America’s allies, demanding they increase defense spending (they already have), and claiming the alliance is a raw deal for the US that disproportionately benefits Europe while we’re left holding the bag. Every public statement from the president further undermines confidence in America’s commitments. Every new statement, every new set of plaudits thrown by Trump at Vladimir Putin’s feet, creates a little more doubt about whether we will stand in common defense of our allies. With all this, our allies must think, perhaps they should look to their own security once again. And so, Mearsheimer might say, begins the return to form. When it comes to understanding international politics, realists like Mearsheimer suggest that it all comes down to the long game. Given time, the standard patterns of interaction that characterize international relations will reassert themselves, sure as one season follows another. Wait long enough and history, or some close variant of it at least, really does repeat itself. I hate to think that Trump is making Mearsheimer right after all.